137 wind turbines from the new Delta4000 series sold in 4th quarter alone.Orders in full-year 2018 amounting to 4.75 GW (+73% yoy) of wind energy. With a volume of 1,679 megawatts (MW) of installed wind energy capacity, also in the fourth quarter the Nordex Group posted a high order intake (Q4 2017: 1.599 MW). This means that in the past year the company received new wind farm orders for more than 4.75 GW (2017: 2.74 GW), equating to an increase of more than 73 percent compared to the previous year. 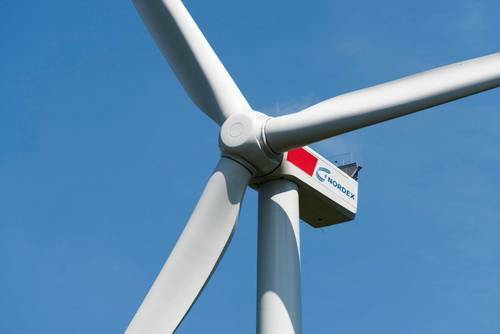 In the fourth quarter of 2018 Nordex customers ordered wind turbines with a volume of 1,679 MW. A large number, approx. 40 percent, were accounted for by the newly launched N149/4.0-4.5 wind turbine from the Delta4000 series. For instance, in the case of the large Swedish wind farm Nysäter, 104 wind turbines of this type – as well as other models – are to be used. Further N149 wind turbines were sold to Finland, Turkey and Germany. In addition to this, Nordex received the first large-scale order in India with 100 of the new AW140/3000 wind turbines. Global new business for full-year 2018 amounted to 4,754 MW (1,423 wind turbines), breaking down as follows: Europe 2,145 MW (45.1 %), North America 721 MW (15.1 %), Latin America 1,190 MW (25 %) and 699 MW in the rest of the world (14.7 %). The United States, Brazil and Sweden were the strongest individual markets for the Nordex Group.